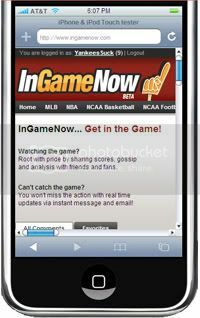 InGameNow formally launched two weeks ago - giving sports fans the ability to receive real-time scores, analysis and rumors via mobile, web and instant messenger. Today, InGameNow has launched an important new feature: the ability to post directly from GTalk and AOL Instant Messenger (AIM). So if you're on the go, you can now receive and send sports alerts from your iPhone (or iPhone 3G if you're lucky! ), Blackberry, and instant messenger clients. That's it. Now you'll never miss a score or a rumor. And you'll never have a reason not to interact with other sports fans.